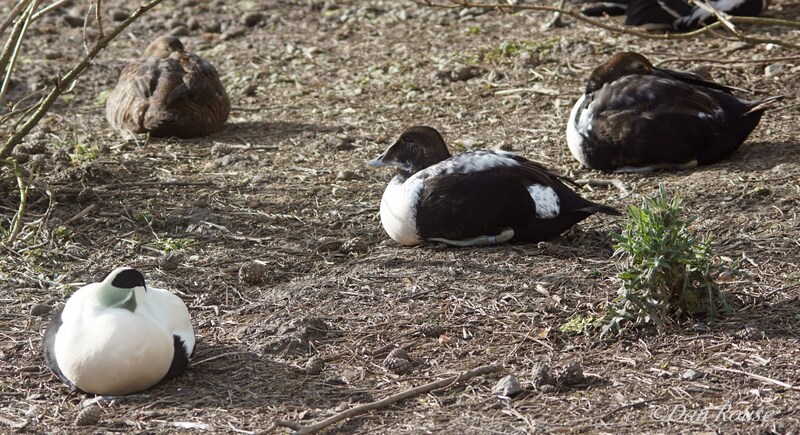 A species that I’ve been keeping my eye on for some time is the Common Eider, below are two examples of intersex birds. Intersex, in a nutshell, is a female bird overtime developing male features this then results in female birds being mistaken for hybrid birds as they don’t conform to what we usually expect a gender of a species to look like. It’s pretty rare but easy to spot in sexually dimorphic species. 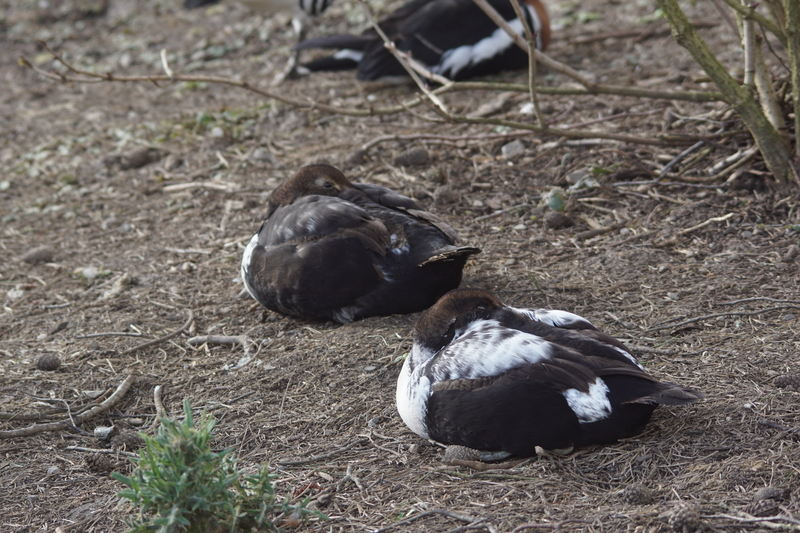 Above are two birds which you would assume to be either males born last year undergoing their Spring moult ready for the breeding season, or older males retaining their eclipse plumage. Both of these birds are infact intersex females. The thing you will notice is that the breast on both birds has changed first, one bird has started to change the wing feathers. There is also a comparison shot with a female and a male. Looking at the heads of the birds, you can see the majority feathers are still female with the bill also resembles that of a female bird rather than a juvenile male or an adult male. Going back to the feathering on the head, females have a very speckled look to each feather resulting in these jaggard like lines, whereas eclipse males would typically have black feathers. 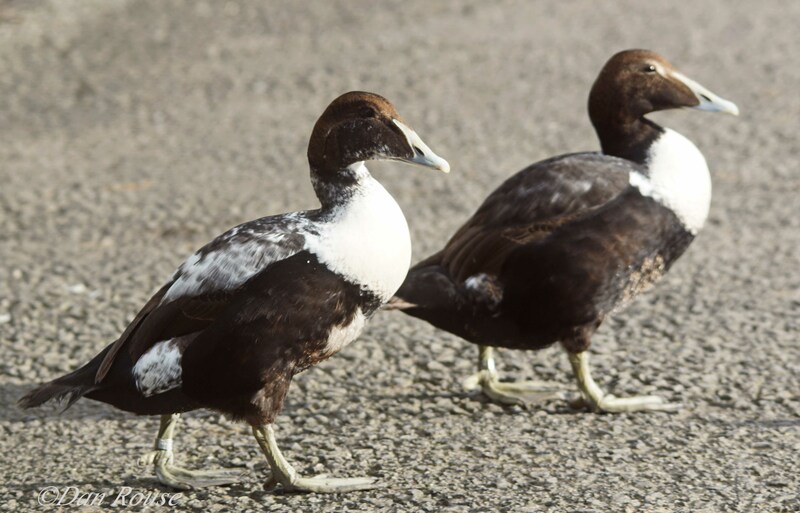 The bird on the left is one of the birds referred to above – intersex female, the bird on the right is last year’s juvenile male who is undergoing his spring moult. You can see how ‘neat’ the righthand bird looks, but this can vary between individuals. The main differences between them are the barring, the female retains that barring on the head whereas the juv male has a brown belly and back with no barring. The head is also very dark on the female as it has retained its usual markings, the male, on the other hand, has a much lighter face and it is very plain like. The photo above shows the evidence of retained female plumage coming through the male plumage. You would expect a male in eclipse to have an almost black head but also to have brown feathers on the wing, the bird in the photo is the more advanced intersex female but that barring is still evident on the head but also on the wings which you can see just peaking through. The breast is also still white as opposed to that peach colour which males in breeding plumage develop. Above is a comparison shot with the three tricky birds in question. You can see clearly the female features still coming through on the two intersex birds both on the head and wings, but the juvenile male has more of a pure brown tone to him. Another giveaway to tell the intersex females from the juv male was the call, the females continued to give their croaking calls whereas the male is beginning to have that distinctive Eider call albeit not as impressive as an adult male. It’s not something that has been featured in a lot of intersex papers, but it may be that intersex birds retain their original calls.